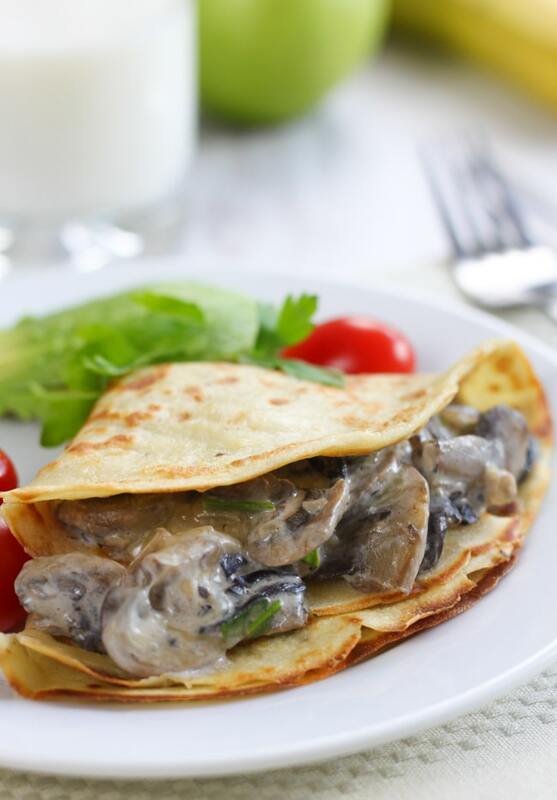 These mushroom stuffed crêpes were entirely a result of thinking I had nothing in the fridge. I had mushrooms, avocado, and eggs… and that was about it (or so I thought!). I was on the verge of giving up and just having scrambled eggs on toast for lunch, but then inspiration struck: crêpes! Much, much more exciting. Whisk it all up together, pour it into a pan, and bam: you’ve got pancakes. They’re soft in the middle, slightly crispy around the edges, and just crying out for a tasty filling. 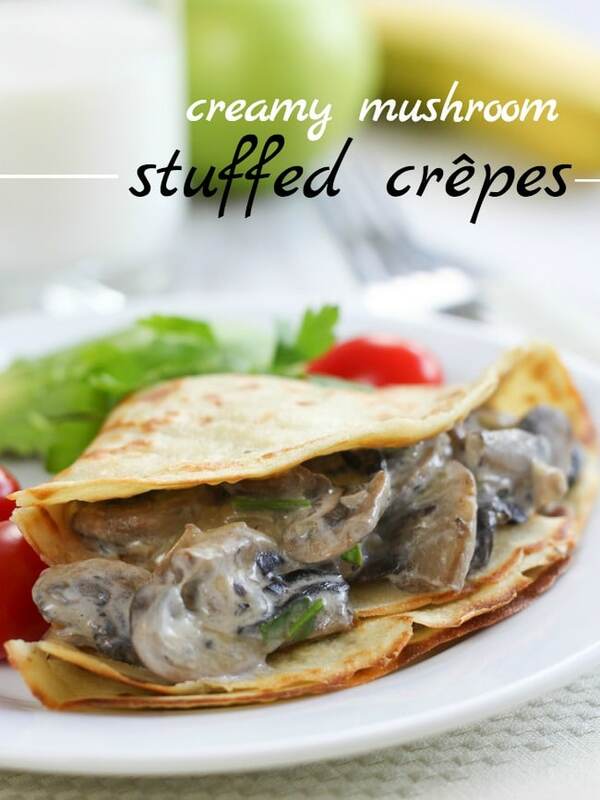 You can stuff your crêpes with whatever you have lying around, sweet or savoury, but a spoonful of cream cheese and a few mushrooms made for an incredible filling, so that’s my recommendation. Don’t forget a generous amount of garlic, a small handful of fresh parsley (which I found lingering in the vegetable drawer), and a little bit of grated cheddar to make everything nice and gooey. Utter heaven. Creamy, mushroomy heaven. Since I had a bit of avocado in the fridge too, I served my mushroom stuffed crêpes brunch-style, with some sliced avocado and a few cherry tomatoes. To be honest, the main reason for this was because I couldn’t bring myself to wait til lunch to dig in… but either way, crêpes are great for any meal of the day. Pair them with a nice big salad, and you’ve got dinner. What’s your go-to ‘oh no, there’s nothing in the fridge’ meal? I’m sure there are any number of meals that can be created from ingredients that we all have lying around at all times – feel free to share any other ideas in the comments! Whisk the egg into the flour in a large bowl. Add the milk a little at a time, whisking until smooth before adding more. Season with a little salt and pepper. Lightly grease a frying pan with a little of the butter, and place over a medium-low heat. Add about a quarter of the pancake batter, and swirl the pan gently until it is evenly coated with the batter. Cook for a few minutes, until the pancake has released itself from the pan (it should move when you gently shake the pan), and the underside is lightly browned. Flip the pancake with a spatula, and repeat with the other side. 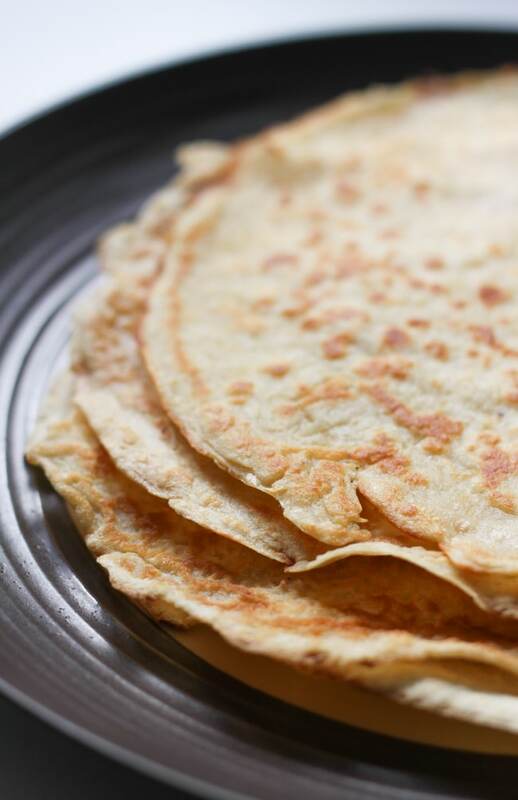 Transfer the crêpe to a plate, and place in the oven (set to a very low temperature) to keep warm while you repeat with the remaining pancake batter. Heat the oil in a different frying pan, and add the mushrooms and garlic. Cook over a medium heat for a few minutes, until the mushrooms have softened. Remove from the heat, and add the cream cheese and grated cheddar. Mix well until the cheddar has melted. Season to taste, and stir through the fresh parsley. 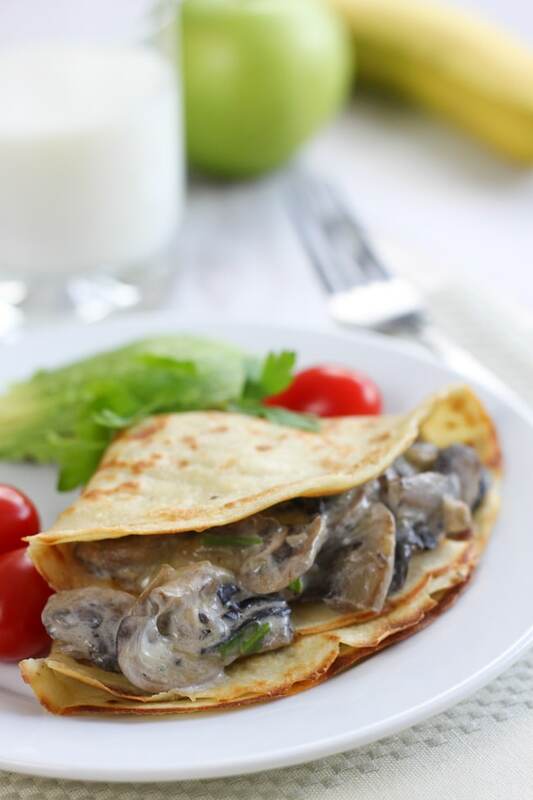 Add a quarter of the mushroom mixture to each crêpe. Fold in half, then in half again, and serve. Yum! Now I have one more breakfast/brunch recipe idea to play with… and I’ll start with mushrooms, Hatch green chiles, bacon and cheese. Your photos, as usual, are amazing! 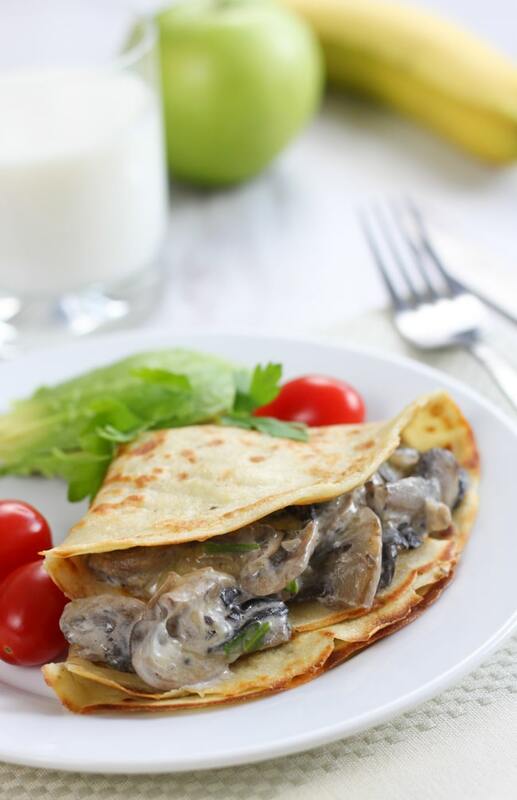 Creamy, mushroom crepes? Can life get much better?! Oh my goodness, these look AMAZING and are making me hungry! 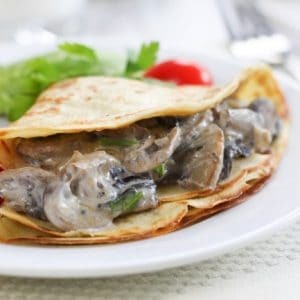 Oh I do love a savoury crepe! I used to live near an amazing creperie and their mushroom crepes were to die for. I’ve not tried making them at home for a long time though. Thanks for sharing! These look gorgeous. I should make crepes more often!! I love pancakes but haven’t tried them with mushrooms. 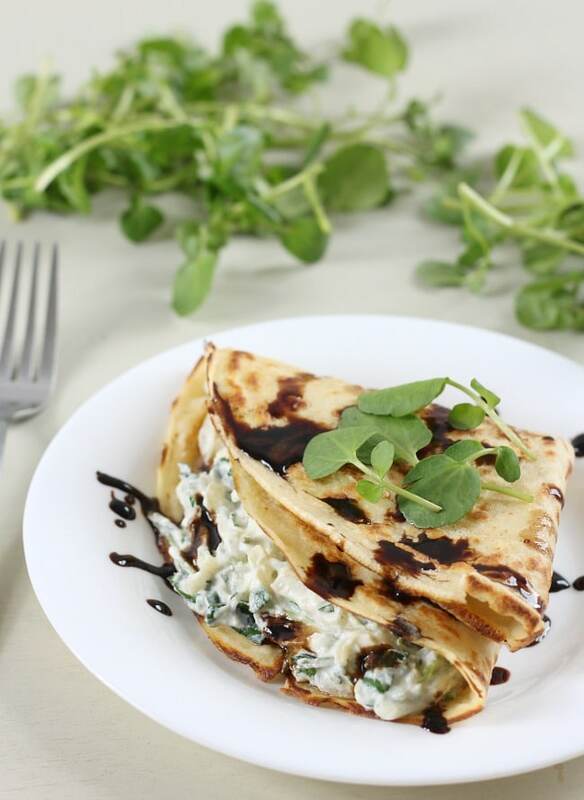 I now will be including this savoury recipe when I make crepes! Mmm these look great. 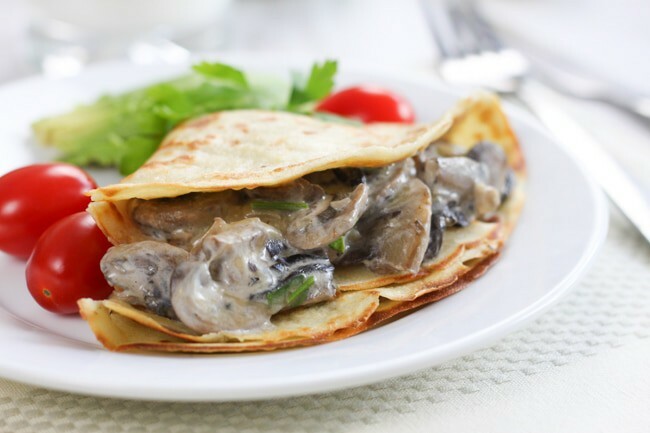 I’m off to Brittany in a few weeks and they never seem to do a mushroom only crepe which I think is a pity. I might have to recreate some of these at the weekend. Creamy mushrooms are one of my favourite low-effort dinners – with pasta or on a jacket potato or on toast. Like the crepes idea too! oh my goodness, you have completely made me want to have crepes for tea now! Haha! I bet you have the ingredients for the crepes already, even if you have to come up with your own stuffing! They look amazing, I love mushrooms in a creamy sauce. On my to-make list! This is a nice simple inventive recipe. I never know what to do with left over cream cheese but this is ideal and yummy. Becca, I have a bowl of porridge in front of me but I wish I could swap for these. I will definitely be trying this soon! BTW, thank you for adding the “Americanized” measurements to your recipes! Makes stealing your good ideas a little easier:). Possibly the first who commented but not necessarily the first who noticed. Thank you Becca! !